Your backyard swimming pool is the perfect getaway after a busy workday, all weekend long, or anytime. 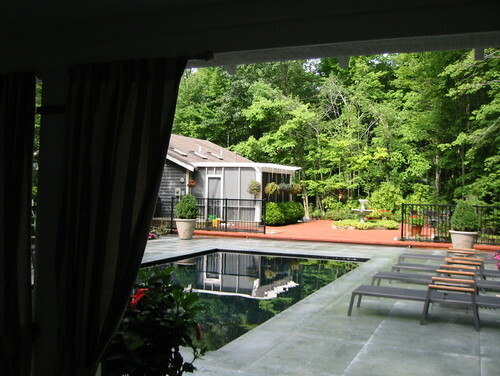 If you are considering a pool renovation and want to enhance that vacation feel, here are some things you can do to give your pool an international flare. While the standard light blue color of most pools is beautiful, it’s becoming more common to see darker colored pools — deep blue or even black. People find that these colors give a pool a more natural feel. Some say they remind them of a tropical lagoon. Pools with seemingly random curves and bends have an exotic look. They may not be ideal for lap swimming, but if your goal is escapism, free-form beats rectangular any day. 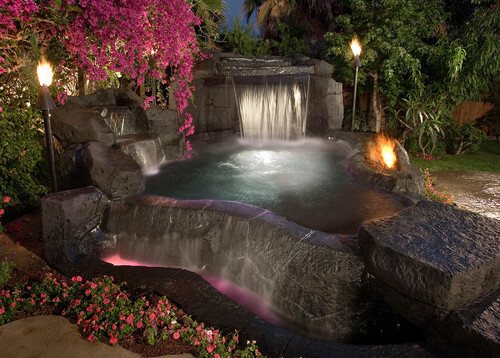 Of all the ways your backyard pool can transport you to the tropics, a waterfall (or two, or three) might be the best. Watching the water cascade down into the pool as you float nearby can be mesmerizing. And not only are rock waterfalls beautiful to look at, the sound of bubbling, gurgling, splashing water can pleasantly block out noise from your surroundings. 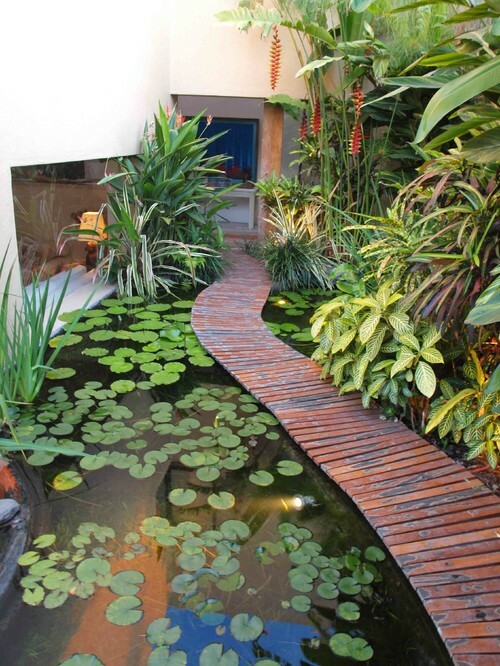 Nothing says “oasis” like a pool that is ringed by lush foliage. While the climate where you live will, of course, affect the types of plants you can include in your landscaping, there are many cold-tolerant plants that lend the same kind of tropical feel as their warm-weather counterparts. Plants that flower with bright blooms are especially good at making you feel like you’re at a resort. If you’ve ever walked around the grounds of a nice hotel in a tropical locale at night, you’ve probably noticed that they go to great lengths to illuminate their landscaping. The swaying palms and colorful blooms that look beautiful by day are even more elegant at night. Installing just a handful of lights trained on the foliage in your pool area can create an amazing transformation. 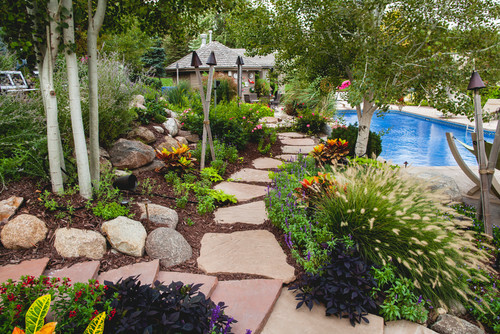 Having a meandering gravel path in your backyard can recall memories of that tropical vacation you took or make you look forward to taking one in the future. Even if your yard will only accommodate a short path, it still serves to enhance the resort feel. Your trip to the tropics can begin today. As you start planning your pool remodeling, we’re happy to answer questions about your options for creating the oasis of your dreams.